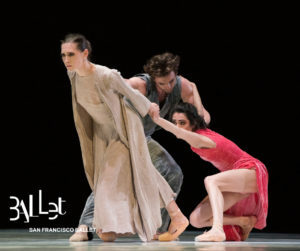 The second program of San Francisco Ballet’s Unbound: A Festival of New Work presented work by choreographers Myles Thatcher, Cathy Marston and David Dawson. Marston and Dawson trained at the Royal Ballet, and Thatcher was trained at SF Ballet, where he currently dances with the company while developing his choreographic skills. Thatcher’s Otherness opened the evening, tackling the difficult question of how social roles affect and distort an individual’s identity, narrowing their life and their potential. The ballet was set to John Adams’ Absolute Jest. San Francisco Ballet in Myles Thatcher’s “Otherness”. Photo by Erik Tomasson. The ballet began with Max Cauthorn appearing outside the heavy gold curtain at the War Memorial Opera House, dressed in a leotard-like costume. When the curtain opens it reveals a troupe of five dancers grouped in front of an abstract tower of blue light–edged panels, the entire stage bathed in aqua. The dancers’ costumes resembled blue bathing suits with bathing caps and goggles. It’s as if we had been dropped into an aquarium, the dancers swimming synchronously, led by Jahna Frantziskonis. A second group appeared clothed in pink, their movements like “1950s swing dance,” intersecting but not joining the first group. When everyone fluttered off stage, Cauthorn was left in blue suit and goggles, Sean Orza in pink collapsed on the floor. The two danced a duet, ultimately changing colored jackets and caps. The ballet’s slightly comic interaction succinctly offers the question, who are we outside of our outer persona? There are collisions, animosities, and a host of other negative actions that impact us and those around us when we accept one perspective of life at the expense of empathy. Thatcher’s choreography was strongest when it stayed focused on dance, but large parts of the ballet were more accurately described as theater, or mimed gesture. Not every action needs to be spelled out for the audience to understand, however, and over-telling the story was a weakness in this ballet. Cathy Marston’s ballet Snowblind was also narrative, very loosely based on Edith Wharton’s 1911 novel, Ethan Frome. The triangle of the farmer who falls in love with the caregiver of his ailing wife was the central motif retained from the story, and it provided ample opportunity for a series of richly choreographed duets while offering the dancers dramatic expression. Ulrik Birkkjaer danced the brooding Frome and Sarah Van Patten his watchful ailing wife. Mathilde Froustey danced the role of Mattie Silver, the young helper Frome falls in love with. Circles were the central motif of the choreography, with Birkkjaer moving his partners in long swirling lifts. He spun with Van Patten in his arms, stretched out like a plank, or curled like a child. He spun Froustey by two arms, then one, her feet barely skimming the floor. The many ways these women were whirled by Birkkjaer as the central pivot were difficult to track, but the effect these lifts created was that of a gravitational force, a kinesis that binds. Sarah Van Patten, Ulrik Birkkjaer and Mathilde Froustey in Cathy Marston’s ”Snowblind”. Photo by Erik Tomasson. The snow that is the ultimate undoing of Frome and Mattie was portrayed on a scrim hanging one-third the way down from the flies, and by a corps of elemental beings in sheer pantaloons dyed from white to brown. When the lovers tried to escape through a snow storm they were caught up by these ethereal dancers and thrown back to the ground, over and over, leaving Frome crippled and Mattie paralyzed. The final trio between Birkkjaer, Van Patten and Froustey had the three dancers gripping each other’s hands, locked in a tangled dependency from which their characters would never separate. The program closed with David Dawson’s Anima Animus, a ballet of abstract formalism based, like Thatcher’s Otherness, on the idea of oppositional binaries. Yumiko Takeshima’s costumes and John Otto’s scenic design followed suit in black and white. The sihouettes created by James Ingalls’ lighting now and then turned dancers into black solids in front of the white background of the upstage scrim. The ballet was set to Ezio Bosso’s Violin Concert No. 1 with Heeguen Song playing violin. Sofiane Sylve, Luke Ingham and Carlo Di Lanno in David Dawson’s “Anima Animus”. Photo by Erik Tomasson. Sofiane Sylve and Maria Kochetkova were the lead dancers, Sylve partnered by Carlo Di Lanno and Luke Ingham and Kochetkova by Henry Sidford and Wei Wang. A quartet of four women completed the cast. The fluid quick moving choreography allowed for multiple solos and some intricate trios that required precision timing as one male dancer would begin a partnering movement that was then completed by the other male dancer. With hardly a breath to be taken. Dazzling solos were delivered by Sylve, Kochetkova and Di Lanno, each infusing the choreography with their own distinctive style. The variety of these three ballets allowed the dancers full opportunity to express themselves theatrically and as dancers, and the orchestra under Martin West was its usual brilliant self. The audience loved every nanosecond. San Francisco Ballet’s Unbound Festival continue through May 6. For information and tickets, visit sfballet.org.